Why fight when you can be creative and impactful? The fight of the races is not something new to the inhabitants of the globe today. We have grown up hearing about how those who are powerful act snobbish and look down upon minor races and those downtrodden ones are always looking out for an opportunity to call it a revolt against the mightier. Although globalisation today has merged quite a few lines of demarcation, verbal racism and the protests against it still exist and they surface quite often. All thanks to our Google-baba again! Talking of racism, do you know who Chris Walker is? If not, fasten your seatbelt! 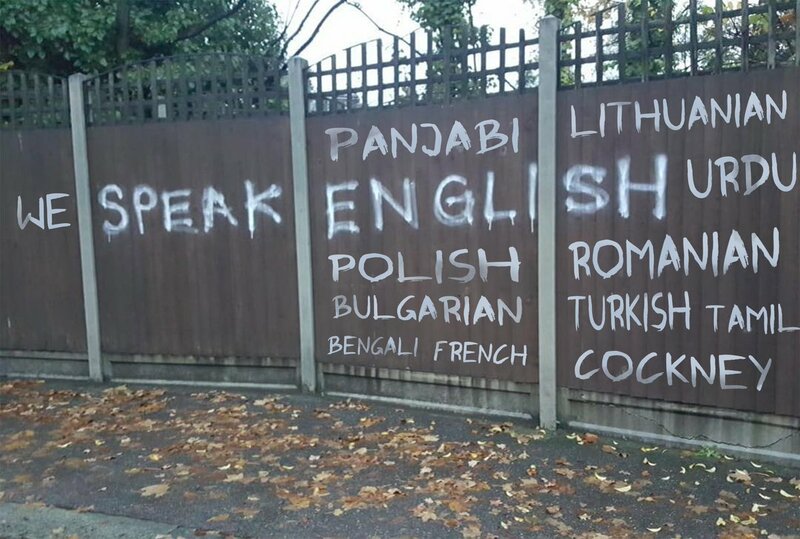 If you look closely at the image before and after, it is surprising how the entire back fence is filled with language names now and as a matter of fact, it looks stunning. This is equality and we are here for it. As a matter of fact, some racist person in the spirit of politics and elections has been doing this graffiti around the entire length of Walthamstow. But, Chris was tired of seeing that graffiti over and over again which promoted nothing but favoritism towards one particular religion or creed. The Twitter family also shared some other famous graffiti which literally changed from being demeaning to motivational. While some pointed out obvious language facts, others just appreciated with ‘heart emojis’ and sweet messages. We are amazed to see such unity amongst people on Twitter. It’s like, everybody is head over heels ready to fight for a good cause! This man, being a doodler himself found it appropriate to counteract and be an example to the world! Art and music, as we have all seen, have been phenomenal in wiping out hatred, bringing about love and compassion among fellow human beings and have erased many discriminations throughout history. We appreciate a man who stepped out and cleared the air off pollution and nonsense. Chris has been sharing this image and the related posts with the hashtag #lovewalthamstow. If you haven’t checked it already, what are you waiting for? Show him all the support in the world! So, that makes us think, why should we fight and kill for the sake of our race when being a little creative can unite the entire globe together?